1979 Mego WGSH Captain America MOC AFA 80 NM unpunched! 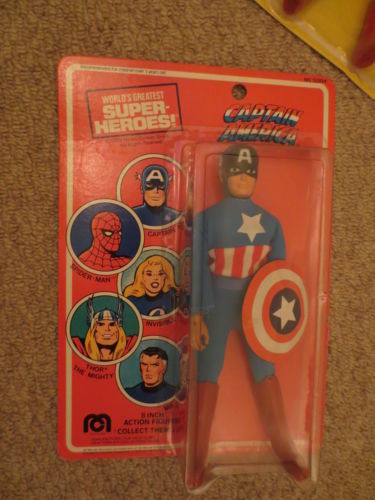 1979 Mego World's Greatest Super-Heroes Captain America, Mint on Card. The figure has been professionally graded by AFA (Action Figure Authority â€“ Home Page) and received a grade of AFA 80 NM. The breakdown is as follows: Card 80, Bubble 80, Figure 85. The serial number is 8915212. The card is unpunched. The bubble is clear, with a small bubble dent in the lower right corner. ALL ORIGINAL!!! Yes, including his chest decal. Only the lightest wear (shield has a small dent in decal and top rear snap has light pulling - as they all seem to get) . Place him in any action position. and red boots holding his shield. The box shows some wear on the corners and edges. 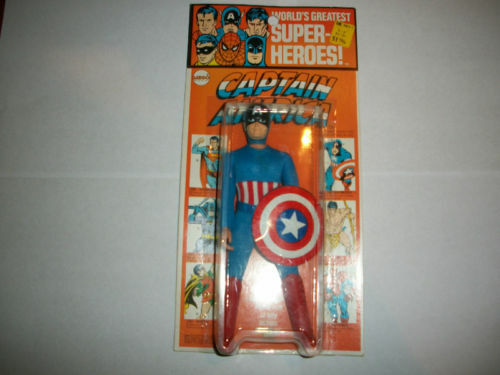 Description: 1972 MEGO World's Greatest Super Heroes CAPTAIN AMERICA on Rare KRESGE Card. Card and Bubble are in excellent condition. Bubble is very clear with very minimal scuffing. The left side of the bubble is not fastened to the card, but it is still tight to the card because the rest of the bubble is very secure. No creases in card. Very good corners... Slight bend on the right side of card (see 3rd pic). Colors are clear and bright. Preprinted 1.96 Price tag is visible under the existing price tag. 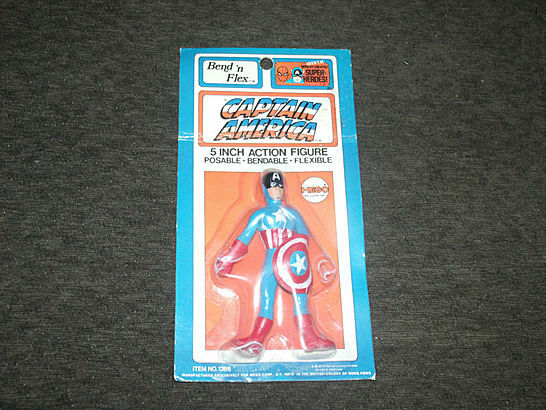 Captain America's Star logo has come off his chest, but is still floating around in the package. In a Google search the last one of these sold for 2900.00. (and that one had a crease in the card and the bubble was lifted) This has been the corner stone to my collection, but I am selling it to raise money for a Disney trip with my son for Christmas. I am selling it as is, and have described it to the best of my abilities. Incredible Example Of The Kresge Captain America 1972...Card Is Completely Sealed All The Way Around...Yes Even At The Feet...No Dings No Cracks No Damage To Bubble At All...Colors Are Bright And Vivid, No Fading...Truly Doesn't Get Much Nicer Than This...Piece Was Purchased In The Last Five Years From Hakes And Has Been Stored In A UV Case Since Aquiring..
1979 Mego World's Greatest Super Heroes Captain America mint on card. The figure is mint and is never removed. The card is sealed all the way around the card. The card looks bright and crisp. There is a crease along the top of the card. Please see pics. The bubble is perfect and free of dents and cracks. 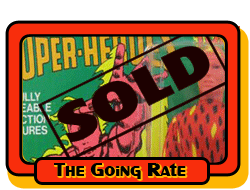 Please see my other auctions which include Mego carded Aquaman, Riddler, Thor and Talos. 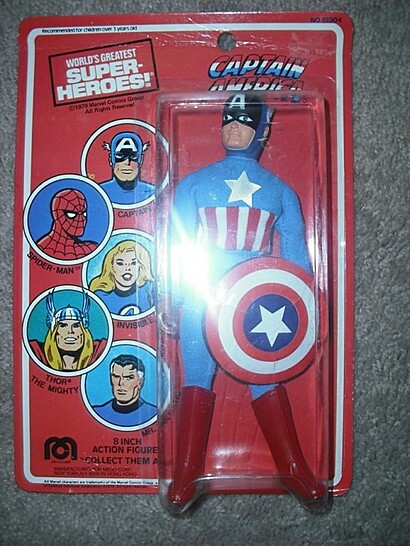 Here we have a very rare Mego 8.5" Inch Captain America Doll Sealed MOC MINT ON ORIGINAL CARD RARE! Box features bright vibrant colours - Bubble is sealed all the way round. Doll has never been removed or played with.Been stored out of direct sunlight in a sealed container. PLEASE CHECK PHOTOS FOR CONDITION!! WE WILL HAVE MORE 1970s MEGO SEALED ACTION FIGURES UP FOR AUCTION SO PLEASE CHECK OUR OTHER ITEMS! !